First of all I’m going to tell you some fun facts about Serbia that you probably didn’t know about. #1 fact – Those raspberries that you are eating are Serbian. #2 fact – Gigantic churches: The temple of the Saint Sava in Belgrade is one of the largest Orthodox churches in the world. #3 fact – All that electricity: Nikola Tesla was a Serb from Croatia and has brought our world electricity. #4 fact – Centuries old manuscripts: Miroslav’s Gospel, written in 1180, is the oldest Serbian manuscript entered in the register of UNESCO. #5 fact – Serbia is a coffee heaven: All Serbs are very fond of coffee and drink it constantly everyday. Serbia is a country of rich ecosystem and species. Serbia is a home to vascular flora, fish fauna, reptiles, bird fauna and amphibian fauna. Its abundance of mountains and rivers make it an ideal environment for a variety of animals, many of which are protected including wolves, lynx, bears, foxes and stags. Also Serbia is a home to highly protected owl species. When it comes to nature, most of people say that Serbia is an undiscovered land, that’s why I’m going to tell you about few wonders of nature in Serbia that you must visit if you come here. The Uvac is a river rising beneath the Pester plateau and the Golija mountain. The river flows across southwestern Serbia into Bosnia and Herzegovina. The meandering river snaking its way through the mountainous route in the upper course provides plenty of opportunities to tourists to capture breathtaking views of the landscape in their cameras. Inaccessible Uvac canyon was an ideal natural dam and an ideal place for building many monasteries. The most famous ones are Uvac Monastery and Dubrava Monastery. A special charm to this natural reserve gives the largest cave complex in the territory of Serbia. The cave system in the valley of Uvac is six thousand kilometers long and together with the meanders contributes to the fact that the Uvac is one of the most beautiful regions in our country. The cave system is characterized by canals in several levels, cave decorations, siphons and halls. The devil’s town is an unusual rock formation created by soil erosion, near the town of Kursumlija in southeastern Serbia. A local legend holds that the strangely shaped rocks are the remains of a wedding party that was instantaneously petrified by the devil, as punishment. The other legend says that there was a witch who lived there and she turned everyone into rocks who didn’t respect her and didn’t do what she said. In total there are 202 stone formations in the Devil’s town between 2 and 15 meters in high. The Devil’s town is definitely a place to visit. Grandiose and slightly menacing figures in day light mystical and illuminated by decorative lights at night these figure will leave you breathless. The Devil’s town consists of two rare phenomena : attractive stone formations as I said before and two springs of extremely acid water with high mineral content. The legend says that if you drink from one of those springs, you will surly return. Tara is located in the western Serbia. It is a part of Dinaric Alps and covers an area of 183 km2 The location of Tara allows development of tourism and visits to variety of different tourist attractions preserved natural environment, mountain relief with hight between 800-1500m, winter sports facilities, richness and variety of different plants and animal life, pleasant climate, river Drina and artificial lakes Perucac and Zaovine make this mountain one of the most beautiful in our country. Tara is a good place for building tourist objects. There are a lot of places with great amount of sunshine and little wind. During winter you can engage in beginner or Nordic skiing or sleighing. Fishing lovers will adore Tara, you can fish on the river or lakes by enjoying beautiful nature around you. There are about 40 species of fish. The Krupaj hot spring is an ecological oasis in the eastern Serbia, in the foothill of Beljanica, lies true gems of nature which on first thought can be found only in fairy tales. Even through Homolje itself is a well – known ecological oasis, the Krupaj springs is still considered a rare and unique occurrence in nature. Apart from the almost hidden pathway and the enchanting sight of the fount, beneath its surface, the Krupaj springs hides an even more fascinating story. According to the stories of scuba divers who dove to 123 meters depth, once you dive into the lake you enter a maze of underwater canals. Even the most experienced divers would be lost trying to dive through the cave. They say the last stop is the “Canal” after which there is nothing but a dark abyss. There is also a legend of the mystical lakes of Homolje. That’s because Homolje and the Krupaj springs are a home to legend shrouded in a veil of Vlachian Magic. The legend says that there is a hidden treasure somewhere in the mountains of Homolje. It is even believed that the mountain itself has swallowed it and that it lies now at the bottom of a golden cave. However, even though no one yet succeeded in finding the legendary treasure, one thing is clear as a day light, the real treasure is the Krupaj springs itself, with all the nature and crystal blue water. Fruska Gora is proclaimed a National park in 1960. in order to provide its permanent protection and to improve its natural resources and beauty. Fruska Gora is an isolated, narrow, island mountain in Pannonia plain. Its location, specific geological history and different microclimatic conditions make it very interesting and important to science. Thanks to unique and very rich deposits of fossil fauna and flora, Fruska Gora is called the “mirror of geological past” The main characteristic of this region is the existence of numerous protected, rare and endangered species. 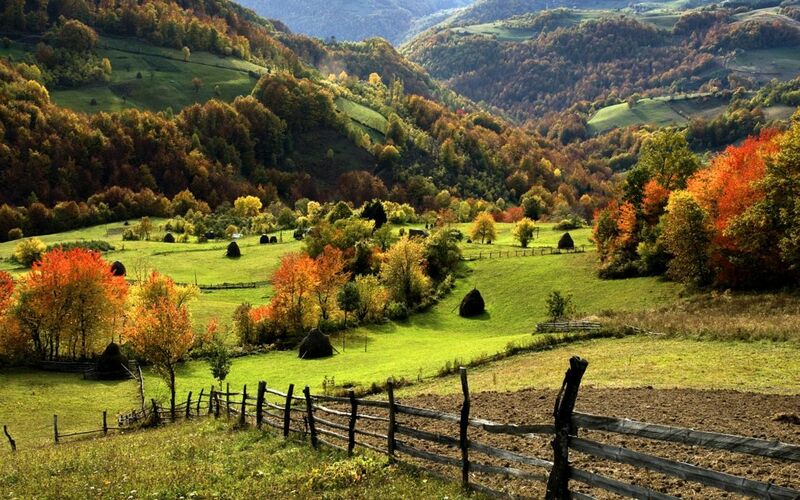 Fruska Gora is covered with pastures and fertile fields as well as vineyards and orchards which decorates the ground. This National Park hides 16 Orthodox monasteries famous for their specific architecture, treasuries, libraries and frescoes and archeological sites from prehistoric and historic times as well. Due to its outstanding natural resources, wonderful landscapes, exceptional charm and beauty, that will bring you closer to nature, Fruska Gora is ideal for you to rest and recreation. Every year there is a marathon organized in Fruska Gora. You can run, ride a bicycle or just walk with your friend through the forest and enjoy all the beautiful nature that this National Park has to offer. A big thanks to Branka for sharing these beautiful locations in Serbia! Click here, for Branka’s Twitter – and here, to see Branka’s blog. My passion is traveling and exploring new things. Student of tourism from Serbia.